I know that other people love comments too. and lots of new folks too. and so I have said nothing. (I think that's the coward's way out). I wish I had said something. and to everyone who commented. "I don't want you to come to my track meet tomorrow," declares my son, in a voice that is less than friendly. "I'm not running and I don't want you to come." I hear this with mixed emotions. On one hand, I am glad that my son does not want me to come. The track meet is about 90 minutes away on rural backroads. It's the end of my vacation and I still have lots I need to do and lots I want to do. On the other hand, I love watching my boys perform. I can count on one hand the number of games and practices I have missed. I am there for them. That's what mothers do. K is insistent. "I mean it. I don't want you there." We go back and forth several times and finally I acquiesce. "All right, I won't come," I say. I am awake the next morning when he gets up at 4:15. I lay there, listening to his 6'5" body tromp around in the bedroom above mine for about thirty minutes. Finally I get up. "Are you sure you don't want me to come?" I ask again. "I'm sure," he says, more than a little firmly. "I don't want you there." He leaves a little after 5 and I go back to sleep for a couple of hours. I wake a little after seven, intending to work on my slice, then spend the day doing yard work and house work. But I cannot stop thinking about my son. I have always been at his meets and it feels wrong not to be there for him. I try, unsuccessfully, to concentrate on my slice. I can't do it. Finally, after 45 minutes of wrestling with myself, I stand up and put my computer aside. I don't care what my son says. I am going to be there for him. That's what mothers do. After a quick stop at the bank, I am on my way. I drive for 90 minutes, drinking in the blue, blue Colorado sky and the picture postcard beauty of Pikes Peak. Finally I arrive. The parking lot is filled with buses and buses and buses. I wonder if I will be able to find my son, but when I come around the corner, he is one of the first people I see, standing there with his girlfriend. He looks angry. "What are you doing?" he hisses. "I'm here for you," I say. "I have never missed an event, and I'm not starting now." He turns away. I head for the bleachers, planning to stay for a couple of hours. Five minutes later, my son stands beside me with his girlfriend. "Do you have any money?" he says. "Can you buy us lunch? R (girlfriend) tried, but they won't take any cards." "So you're talking to me now?" I say. "Yeah, I guess," he says. "Why did you come?" "Because that's my job. That's what mothers do." We walk to the concession stand, and I buy $10 worth of chicken sandwiches and gatorades. I remember a candy bar, purchased to meet a $5 minimum at a convenience store, that I have shoved into the bottom of my purse and hand that to him as well. "You're the best," says the son who did not want me to come. "Are you staying to watch me run?" says R. "You missed my first events, but I will run again later, toward the end of the meet." I tell her I have to run an errand before three, back in town, but I will stay as long as I can. Track, in my opinion, is about as exciting as watching paint dry. Thirty seconds of action, followed by ten or fifteen minutes of waiting. I sit there for one hour, two hours, three hours, almost four. I try to read, but have a hard time concentrating. Finally, I find myself standing by the fence, holding a pair of kind of smelly pink tennis shoes, while R runs. I cheer frantically, throw the tennis shoes over the fence, and give my son a hug, then dash to the car so I can make it back to Denver to run my errand. Eat this in remembrance of me. drink this in remembrance of me. is plunged into the depths of hatred. Earlier this month, I wrote about how my black lab, Star, has a direct connection to the Bread Fairy, who makes regular deposits in our neighborhood. Now it seems that Star also has a direct connection to the Easter Bunny. Let me backtrack a little. Last weekend I was at the grocery store. Because Son #1 is 900 miles away, and won't be home for Easter, I decided to put together an Easter basket, and send it to him. And then I decided that while I was buying goodies for his basket, I might as well buy the materials to create baskets for Son #2 and for their sister. I made Son #1's basket and mailed it off earlier this week, then I hid the rest of the candy in the back of my closet, so no one would find it before Easter. Today, I had to run to the grocery store to buy washer fluid, which Son #2 had asked for, and which I had forgotten. I was gone, umm, maybe about 20 minutes. Usually, when she is left home alone, Star hangs out on the couch, watching out the front window, waiting for someone to return. As soon as I open the front door, she's all over me, licking me, knocking things out of my hands, etc. Today was a little bit different. I came back from the store and opened the front door. It was a gorgeous sunny day, and we have a dog door, so I thought maybe she was out back, enjoying the sun on the deck. I called her name. By now I was starting to get a little worried. Star always greets us when we come home. I wondered if someone had left the gate open and Star had gone on one of her regularly scheduled field trips. I walked through the house, calling her name. I could hear something out in the backyard, so I went outside. She was having her own private Easter egg hunt. Somehow, she had gotten into my closet. And found the Easter candy. In the twenty minutes I was gone, she ate a chocolate bunny. And a 12 pack of Peeps. And a large bag of jelly beans. The remains of the second chocolate bunny was hanging out of her mouth. And amazingly, she isn't the least bit sick. She keeps going back to my closet and sniffing at the door. She's hoping that the Easter bunny might have left something else for her. And then I am the quarterback's mom. It happened, actually, kind of unexpectedly. Zay, who was on the 9 and 10 year old team, had practice that day. K, who was on the 7 and 8 year old team, did not have practice. K and I were at the park, then, watching his brother. Actually, I was watching and K was throwing a football on the grass with another player from his team. For whatever reason, K's coach stopped by the field to bring me something, probably information from the latest of the never-ending football fundraisers. The coach and I were talking, when all of a sudden, he stopped mid-sentence. "Did you see that?" he said. I am not sure what he is talking about. "Does he always throw like that?" I still don't have any idea what he is talking about. My gaze follows his finger and I realize he is referring to my son. I shrug. "I guess. He and Zay throw the ball around the yard all the time." Coach N cannot believe his eyes. He jogs down the field and asks my son to throw the ball a few more times. And with that, a quarterback is born. And so is a quarterback's mom. Which is at least as complicated as the quarterback. (For those of you who don't know much about football, the quarterback is kind of like the lead player for the team. Generally, especially with kids, the coach calls the plays from the sidelines, but it's up to the quarterback to communicate them to the rest of the players and then to lead the team as they execute them). I soon discover that there is a lot to being the quarterback's mom. Perhaps one of the most important jobs, especially when the quarterback is young, is keeping track of all of his gear. The quarterback, for instance, has a special armband. It's about six inches wide, and has a plastic pocket on it. Every week, the coach creates plays appropriate for the team they are playing against. And then the team practices those plays all week. On Friday, the coach emails the plays to the quarterback's mom. Usually about midnight, so they will be ready in plenty of time for the 6:45 am warmups. And it is the mom's job to print them, and then cut them out so they fit perfectly into the little pocket on the wristband, so they will be ready for the next day's game. The quarterback has other special equipment. There is the sacred towel. This is not a regular old, buy at W-Mart or JCPenny on the white sale table for $1.99 towel; instead there is specific brand of towel. It's kind of shaped like a triangle. And it has velcro on the pointy end. And costs quite a bit more than a regular towel, usually about $8.99. The quarterback uses it to keep his hands dry so that he can handle the ball accurately. On sunny warm days, the quarterback only needs one towel. Although it is always good to have a backup, because one never knows when said towel may get yanked off, and thrown in the one mud puddle on the field. And then the towel will have to be replaced (or retrieved by the aforenamed quarterback's mom, who does not have millions of dollars to keep buying new towels, and is consequently the one seen wading into said mud puddle to retrieve the towels). On cold days or wet days, though, that's another story. On those days, the quarterback needs at least four towels. One for every quarter. Or sometimes more. And he also needs a handmuff, a tube-shaped pocket that straps around his waist. Inside of that are little hand warmers, tiny plastic packets with chemicals that magically release warmth when they are rubbed. The quarterback's mother must have an endless supply of these packets during football season, because the quarterback dispenses them freely to other members of the team who also need warm hands, so they can catch his passes. (And in case you are wondering, running backs also use those inside their special $52 pair running back gloves). All of this gear must be readied and packed in the quarterback's bag the night before each game. The bag must then be placed by the front door. Heaven help the quarterback's mom who forgets the all-important gear bag (don't ask me how I know that!). In addition to being in charge of the quarterback's gear, the quarterback's mom is also in charge of the quarterback's diet. This is a highly specialized and ongoing project. She has to make sure his favorite breakfast foods are in the house for the morning of the game, or when he gets to high school, that he has enough money for a healthy carbohydrate-loaded lunch, and also to make a Chipotle run after school, since he will not eat again until roughly 11 p.m. that night. When he gets to high school, she also has to throw in a little extra, so that any lineman who do not have his own money will be able to eat too. She doesn't want weak, starving linemen protecting her son. When the quarterback is young, before he gets to high school, it is the quarterback's mother's job has to make sure that the all important game day rituals are followed. No one (except the quarterback and his brother) is allowed to complain, nag, or be otherwise unpleasant on game days. The quarterback can carry his game bag, and possibly his helmet, but should never be asked to carry anything else, e.g. the team water cooler, because he might expend energy that he will need later. The music station has to be set to the quarterback's favorite hip hop station. If it's an away game, the qb's mother must mapquest the route ahead of time. She should not expect the quarterback or his running back brother to help her figure out where the field is. They are in their game heads, not to be disturbed. And once enroute, absolutely no one is allowed to talk until the car arrives at the field. Please be aware, too, that while no one is allowed to talk, the quarterback's mom is in charge of the quarterback's attitude. She has to make sure he is "up" for game day. This process begins early in the week, as she sits on the sidelines at practice, noting good plays, so she can point those out to him periodically throughout the week. She is also allowed to give thumbs ups or encouraging smiles throughout the week. She is not allowed, at any time, to shout things like "Good job, sweetie!" or "Great throw, honey! "even if it's true. The quarterback's mom needs to make sure the quarterback doesn't get discouraged when things are not going well. Sometimes this means patting him on the back and assuring him that he is doing fine. Other times it means hissing, in a voice not to be heard by other parents, "You get your act together, do you hear me? You are eleven years old. Put on your big boy pants and act like a quarterback." Sometimes, unfortunately, taking care of the quarterback also means protecting him from crazy parents, intervening when over zealous, game crazed adults, who should have remembered they were talking to a child, yelled at him, or blamed him for the team's errors. Because her son is the quarterback, and allegedly the leader of the team, the quarterback's mom becomes the leader of the parents. The coach depends on her a lot. She gets to organize everything from rides to the games, to filling the water jugs, to buying and cutting oranges and hauling them around in tupperware bins for halftime, to keeping track of the number of plays each player has had. She gets to plan the team picnics and team banquets. She gets to start all of the phone chains, and turn in the roster to the umpires each week. In high school, she gets to stand up and talk at parent night. And wash the stinky uniforms every week too. There is a lot to being the quarterback. But I think, perhaps, there is even more to being the quarterback's mom. When I look back through my slices, I find many about Son #1. And only a few about Son #2. While that has not been a purposeful decision, I think it does represent the state of my relationship with my boys. My sons are very, very different, both in looks and in personality. Son #1 was much harder when I first adopted the boys- volatile, prone to kicking, throwing, breaking, screaming rages. Son #2 was quiet, withdrawn, really only expressing unhappiness each evening when I turned off his much loved Xbox and enforced my "only an hour of screen time and only after homework" rule. Over the years, however, it's been Son #1 who has become much more attached. Son #2 has remained silent, aloof, withdrawn. I haven't written as much about him because quite honestly, I'm never quite sure what to say. Despite ten years of trying and despite years of therapy, we are still really not all that connected. I've decided (and this may be a one day decision), then, to try to write a few slices about Son #2.
waiting for his car to be detailed. Launching Son #1 on his 900 mile journey to college. I would have loved for Son #2 to ride along. in the car with me. That was probably at least partly true. even when there was no one else. two hours after school has let out. against the darkness of the world. Nine years on the football field. Son #1 a running back. they know each other's rhythms perfectly. make sure he is safe. and they will take care of each other. Son #2 must be feeling. And so we sit at the car wash. I can hardly stand it," I say. how you must be feeling." Thursday night. I have an appointment at 6. Traffic in Denver is pretty unpredictable, so I leave work at five, just to make sure I'm on time. Sometimes I leave at 5, and get there with only minutes to spare. Other times I leave at five, and am there in twenty minutes. Tonight, I am there in twenty minutes. We are finishing our state tests, and I'm tired. It actually feels good to sit and wait. And I love this office, because she has lots of good magazines. Ones I wouldn't necessarily buy- Readers' Digest, Prevention, Cooking Southern Style (that might not be the exact title, but it's the gist of the magazine)- but that are kind of fun to read. And who cares if they are six months old. It's not like I'm reading six month old issues of Time or Newsweek. I am leafing through a Readers Digest from last June when I find it. An article about five high school students who had survived a bear attack in the Alaskan wilderness. One of the kids, Sam Gottsegen, is actually from Denver. He's even a student in the Denver Public Schools. By the time the doctor comes out to greet me, I am practically worked into a frenzy. "Can I please borrow this magazine?" I ask. "I promise I will bring it back." Roxanne looks at the magazine, then at me. "That one?" she says. "It's six months old. You can have it." "Are you sure?" I say. "I can bring it back when I come next time." "Carol," she says a little more firmly, "you can have the six-month-old Readers' Digest. I don't need it back. There are plenty of magazines here. Just take it." I shove my treasure into my purse, careful not to bend the corner. You see, I am a woman with a plan. For the entire week of state tests, I have been filling the time between tests by reading aloud to my group of seventh graders. I chose a brand new book by Colorado author Will Hobbs. 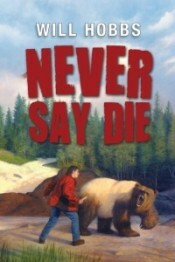 NEVER SAY DIE is the story of Nick Thrasher, a teenager growing up in a remote part of Alaska. While hunting caribou to feed his grandfather, who is dying of cancer, he encounters a strange and aggressive creature, a hybrid grizzly and polar bear known as the grolar bear. Shortly after that, Nick is contacted by an older brother, who is a wildlife photographer. The brother wants Nick to accompany him on a rafting trip to a remote region where they will take pictures of the caribou migration. On the trip, they once again encounter the mysterious grolar bear. My seventh graders are enjoying the book, but they are not quite sure they believe the bear piece. They don't believe that bears are that big. Or that they can run that fast. Or that they would be that aggressive. Nothing I say or do convinces them. But now I have an article. With pictures, In a six month old magazine. I cannot wait to share my treasure with my students. Because that's what readers do. So I think I missed this parenting chapter too. The one about where the son dates a girl. And cute as a bug besides. who married his high school sweetheart. Posted yesterday about daffodils, then woke this morning to a blizzard. Ok, maybe not a real blizzard, not one of those two feet of snow, the power's off for a week blizzards like all my New England friends have experienced all winter, but it is a good 8 inches of snow, and still coming down hard, and sideways, a nice day to stay inside and read or bake cookies or finish my taxes that I started two weeks ago kind of day. I decide I will finish my taxes. The ones I started two weeks ago. When I had deluded myself into believing that my organizational skills might be getting a little better. I actually did quite a bit on my taxes two weeks ago. Now I am at the point where I need to go through my bank statements and find all of the charges for my son's college tuition, Kinko's, International Reading Association, etc. And yes, I am very much aware that there are some people who have systems in which they keep track of those kinds of tax deductible expenses throughout the year, and thus do not have to spend hours sorting through bank accounts during tax season. And no, I am not one of those people. So this morning, after I have procrastinated for an hour or so- eaten breakfast, responded to a few slices, started a load of laundry, looked out the window to calculate the amount of snow that has fallen, chatted with a high school acquaintance on Facebook- I decide that I will log on to my bank account and begin working on my taxes. The problem is, I can't log on. I try to call the customer service line to identify the problem. I get a recording saying that I am calling after business hours. I'm pretty sure, actually positive, that they are open for two more hours, and so I decide that I will just head over to the bank. I bundle up in my warm clothes and slog out to the car. I should shovel, but I am determined to do my taxes, and I want to make sure that I arrive at the bank before it closes. Unfortunately, my car is buried under a foot of snow. I hunt down the snow brush. We have had a really mild winter, no snow at all until mid-February, and I haven't used it much at all. When I dig it out from under the seat, I remember that Son #1 told me that he broke it when he was home in December. The handle is now only about six inches long. I realize I am going to need a different implement. I slog back to the house for the snow shovel, then back out to the car. I shovel the foot of the snow off of the car, then throw the shovel in the back, so that I won't have to slog back to the house. I head for the bank. The roads are either 1) plowed and icy, icy, icy OR 2) not plowed and like driving through a snow drift. I persevere. I am determined to finish my taxes. The bank parking lot has been plowed, kind of. It's warm enough, I guess for the plowed snow to start melting. I slog through about six inches of water and arrive at the front door with my feet and the bottom of my jeans dripping wet. The bank is usually crowded, but today it's empty. Empty that is, except for two tellers and three people waiting to see the customer service manager that I need to see. The teller informs me that my wait will be an hour. "No problem," I say. I sit there for about five minutes before I decide I need something to read. The bank doesn't have any magazines, but I remember I have Will Hobbs' newest book in my work bag in the car. I slog back out through the foot of water, get my book, and head back in to wait. Now my feet and the bottom of my jeans are beyond wet. I read for 20 minutes and am just getting to a good part when the bank manager comes out to talk to me. Their system is down. She won't be able to fix my account until 1:00. She promises she will do it before she goes home, but that it will be a while. I tell her I really need to do my taxes. She tells me that I don't have to worry, that she will take care of it, but that I don't need to wait. I slog back out to the car and head for home. On the way, I remember that there was an issue with a bank account at a different bank this summer. The account had to be closed. I will need to go to that bank to get the rest of my information. I head for that bank. The 15-minute trip takes about 45 minutes. This time, I don't chance it. I take Will Hobbs with me into the bank, just in case I have to wait. I explain my situation to the banker. He prints out the information I need and I am on my way. No wait at all. I am determined to finish my taxes. of administering state tests and makeups. Then I attended a required two-hour professional development session. while their sinkful of dirty dishes waited for me. that happens right before night comes. which have caused me to take several knee-skinning spills. 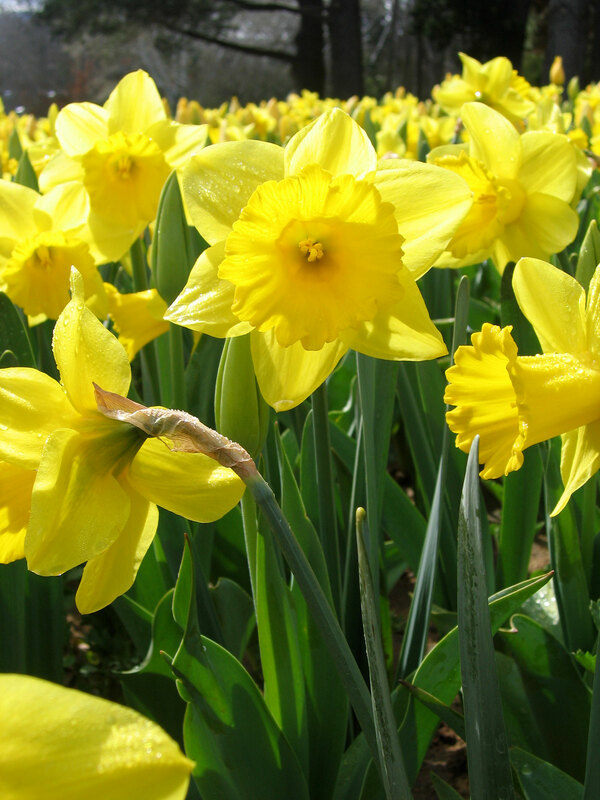 The very first daffodils of spring. at the end of the leash. is about 15 years old. It's still one of my favorite spring poetry collections. I share this poem every year about this time. Just a little. A haiku. That morphed into a baby poem. That might become something else later on. When I have more time to play with it. If you want more poetry, head over to Poetry Friday at Greg Pincus' Gotta Book. Greg hosts an amazing poetry celebration every April.